The Friendship Division's pool play saw a lot of exciting plays and buzzer beating finishes. When the dust had settled, the teams making the Medal Playoffs included 3-point loving Washington CYC B, 2k4 Senior runners-up NY Fishmen, the much improved NY United East, and the hometown Chicago Dragons. Up first was Washington CYC B meeting up with the Chicago Dragons. Washington really had the chance to pull away, after taking a 25-17 halftime edge. But Chicago would not go away. They were sizzling in the second half, to get within 2 with under a minute to go. Jimmy Zhao played an aggressive game for the Dragons but he missed 2 key free throws that would have tied the game up. Washington then hit 1 of 2, and Chicago came down with a great opportunity to tie the game. But CYC's John Hsu had other ideas. He stole the pass and then sank 2 FT's to push his team into the Finals. In the Finals, CYC B would meet up with the NY Fishmen. 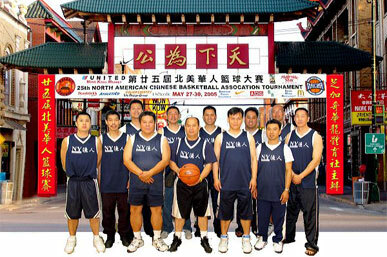 The Fishmen defeated their young cross town opponents, NY United East. Yean Liu and Kenny Lee forced United East into foul trouble early, and in the second half, the old guys held UE to only 3 points for the entire 20 minutes in the best defensive effort from any team in the entire Tournament. When the Finals came by, CYC B had a ton of confidence from the previous day, as they had handily defeated the NY Fishmen in the final game of pool play. With CYC suiting only 6 players, foul trouble became an issue early. CYC was unable to run the fast break to take advantage of their older opponents, and the Fishmen played the game how they wanted to play it: S-L-O-W. They posted up the smaller CYC team time after time. Although Washington had a 7 point lead, the Fishmen never seemed concerned. CYC couldn't "san mun" as they missed 9 free throws to give the Fishmen multiple chances to get back in it. With time winding down, MVP Kenny Lee was an absolute warrior as he scored a 3 point play to send it into overtime. In the bonus period, NY outscored DC 5-2. CYC had one final chance to tie the game, but they missed the shot. The Fishmen won the Friendship title 44-41.